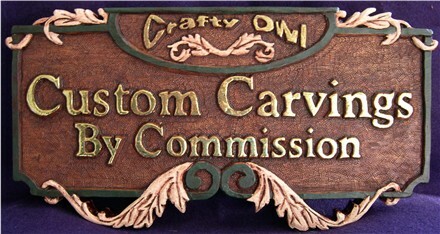 Hand carved for Crafty Owl's show booth, this mahogany wood sign features 23kt. Genuine Gold Leaf lettering, painted highlights and a textured background. The textured background is accomplished by taking a metal punch which has been filed into multiple points and using a hammer to create the tiny background holes. While labor intensive, this creates an interesting visual that draws attention.